After a looooonnng mid-season hiatus, I’m back with this wonderful nonsense. The story picks up shortly after the end of the previous episode, with Sara and Ava taking the possessed Stein puppet to the Time Bureau to be locked away. Hank makes a remark about Ava “finally showing up to work” even though he was just out golfing with a demon. I type the weirdest things for these reviews, I swear. The footage of Konane’s escape has been doctored to make it look like Mona set him free. She’s in the hospital recovering from being clawed by Konane. When Gary comes to fire her and erase her memory, she turns the tables on him and escapes with his time courier. Outside, she runs into Konane, sends him through a time portal, and then gets captured by the Legends. Well, “captured” because Mick shot her with a tranquilizer gun thinking it was a gun-gun. Oh, Mick! Mona tries to tell them about the shady men in black dudes who were abusing Konane and trying to transfer him to another facility, but Sara thinks she’s crazy. Zari wants to investigate the Bureau anyway, so she does that while Sara, Constantine, Mick, and Mona go to 1961 Mexico where Konane has become a celebrity wrestler known as El Lobo. His undefeated streak has led El Cura, a wrestler whose career Constantine is familiar with, to drink away his misfortune. Before the Legends can drag Konane away from the ring, El Cura challenges him to a lucha de apuestas – a match where they bet their masks and their careers, with the loser retiring. I couldn’t find anything on an El Cura, but there was a real-life wrestler known as El Santo with a similar storied career. El Cura (“The Priest”) has a gold mask while El Santo (“The Saint”) wore a silver mask, so it’s safe to assume El Cura is inspired by El Santo. And that’s your historical factoid for this review. Nate catches Zari going through the Bureau’s files, but she’s found something – the security records were altered from a mobile phone. Nate recognizes it as his dad’s number and decides to take Zari to a fundraiser in order to get the footage from Hank’s phone directly. The Legends capture Konane and lock him up on the ship. Zari tells Sara what she’s found so far, and when Ava calls, Sara hangs up on her because she doesn’t know if the line is secure. Oh no. She gets dressed up and heads to the benefit dinner, leaving Ray in charge. Ray schools Constantine and Charlie on how to be a Legend without screwing up the timeline. 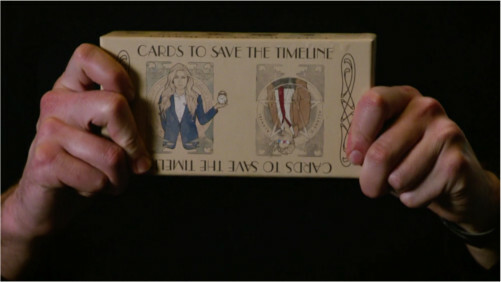 The irony is hilarious on its own, but he makes a game out of it: Cards To Save the Timeline! I am so mad that I can’t read those cards. Hey, CW merchandising people! Beebo plushies and this. GET ON IT. The timeline, however, is already screwed up. Because El Lobo disappeared in 1961, the government was blamed and deadly riots erupted because, y’know, sports. Constantine and Charlie talk Interim Captain Palmer into fixing the problem themselves and it totally works. Constantine and Mona train El Cura with Konane’s “help”. Mick doubts Konane can be trained to lose, but Mona shares an inspiring story from one of her favorite Rebecca Silver books about Buck and Garima. Mick lets that slide for now. At the dinner, Zari poses as Nate’s girlfriend and gets blushy when his mom brings up grandchildren. Ugh, are we really doing this? I’m not a heterophobe, but it seems like every one of these shows has to have a token straight romance now. And it’s always so forced! Let it develop naturally as part of character progression. Oh, and Sara tangos with Ava while talking about…something? I dunno, I was distracted. Right, Ava is mad because the Legends have Konane in custody and won’t turn him over to the Time Bureau. The Bureau finds out about 1961 anyway and they charge in to capture the beast…because that’s always worked out so well for them. They arrive and evacuate the arena just as Konane and El Cura are having their match. After some brawling, minor rioting, and Charlie working up the crowd, El Cura and Konane are celebrated as heroes and history is back on track. Nate and Zari recover the footage and prove Mona’s innocence. Nate confronts his dad, but pretends to be okay with it in order to be the Legends’ inside man at the Bureau. Sara tries to make peace with Ava, but it doesn’t happen. Ava is still mad and she’s not convinced by the evidence against Hank. In fact, in a very out-of-character moment, she says she approves of torture and experimentation on the magical prisoners in order to preserve human history. Yikes. I know they need to set up some kind of breakup arc for Sara and Ava because an endless string of breakups and reunions are what passes for romance on television, but this is just forcing bad characterization on Ava. This isn’t the same Ava from a few episodes ago who agreed to treating prisoners more humanely. This isn’t the Ava who’s learned to trust the Legends and their unorthodox methods. I really hope Ava is under some kind of mind control or demonic manipulation, because Ava Sharpe would have had Hank arrested for the crap he’s done and would immediately reinstate Mona. Mick tells Mona that Garima and Buck were just too different to be together, even if they did love each other, driving home the point that she needs to let Konane go. She tries to send him back to Hawaii alone, but he’s shot and killed by one of Hank’s lackeys. Enraged, Mona transforms into some kind of were-kaupe and kills the attacker. This one was fun. There were all of the silly and heartfelt moments you expect from Legends, with a little lucha libre thrown in for action. 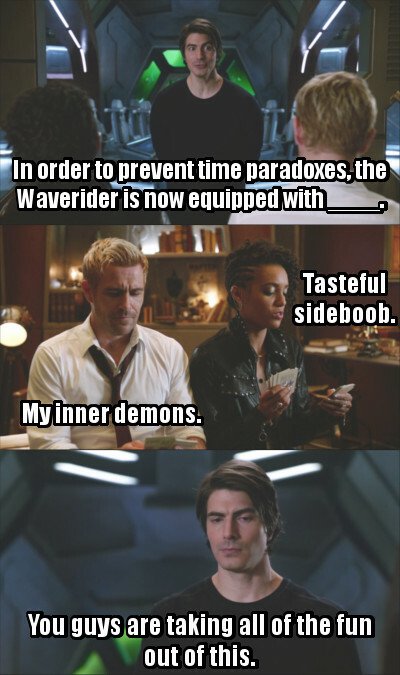 I’ve missed my time traveling disasters so much. I like the setup for Mona to become another magical fugitive for the Legends to protect, but making the Time Bureau a secondary group of antagonists again is a little silly. I was hoping the Legends would be forced to work separately from the Time Bureau while Hank and the government had their hands in it, but going all in on setting the Time Bureau and Ava against the Legends just doesn’t sit right with me. I’ll withhold proper judgment until I see where they’re going with this, but Ava suddenly being pro-torture and specifying that her job is to protect human history just sounds like a pretty big heel turn. Next time: road trip episode! !